After driving over 600 miles in the last two days, I greatly needed a good beer tonight. After much deliberation, I opted to go with an old, reliable choice: Pauwel Kwak, a very unique Belgian Strong Ale. 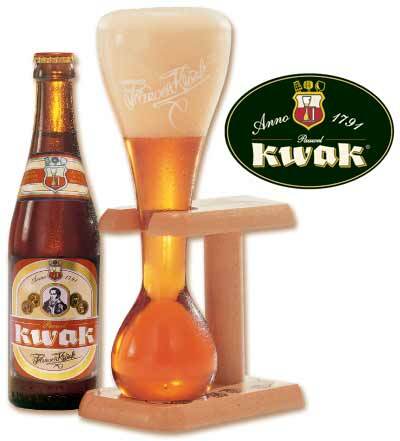 What makes Kwak so unique is that it uses a distinct glass that is unlike any other I have seen, Belgian or otherwise. The brewery claims that the glass, as shown above, was designed by one Pauwel Kwak, an early 19th century innkeeper. The story goes that the inn was a popular target for mail coaches, but the coachmen were not allowed to leave their coach/horses. Therefore, they could not have beer. Our man Pauwel created a glass that could be hung on the coach, and this type of glass is still used today, currently with the wooden contraption to hold it. During my trip to Belgium last year, I made sure to pick up an authentic glass to bring back home. This is a beer that is all about presentation, and this is what makes it stand out from other Belgians. However, Kwak is still a damn good tasting beer. When poured into its trademark glass, Kwak has a deep amber color and smells of caramel and dark sugar. Its taste is of caramel, toffee and even some hints of bananas. There is a bit of spiciness, too, which I am noticing for the first time tonight. The higher ABV is apparent, but the beer remains easily drinkable regardless. While some might be quick to dismiss this as a novelty or gimmick beer, I don’t think that is fair at all. It is true that using the proper glass enhances the drinking experience, but Kwak is still a great, great beer that ranks among my favorites. Plus it’s always fun to have a friend try it for the first time without knowing anything about it beforehand.